Year or day designation in the sexagenary cycle (jikkan-jyunishi). Koshin designates any year or day that falls on the combination of ko, the seventh of the 'ten stems,' and shin (shin means monkey), the ninth of the 'twelve branches ' or zodiacal symbols , a combination representing the fifty-seventh year or day of a complete cycle of sixty. According to Taoist tradition, on the night of a koshin day the 'three worms'(sanshi) believed to dwell in the human body escape during sleep and report a person's sins to the Celestial God, resulting in a possible shortening of that person's life. During the Heian period, the worms' escape was practiced among Japanese court nobility, who fought off sleep all night(koshin-machi) . This custom, known as populace during the Muromachi period. All-night koshin-machi are a thing of the past, but the custom survives in this region in an abbreviated form. You can see three monkeys who clasp both hands over their eyes, ears, or mouth, thus not seeing(mizaru), not hearing(kikazaru), or not speaking(iwazaru). 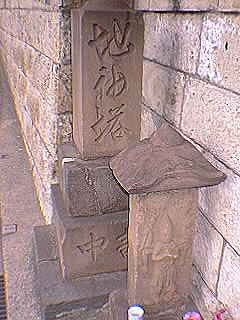 Beginning in the late Muromachi period, it becames customary to carve on koshin-to, stone pillars used during the observances of koshin. The Three Monkeys represent the Three Truths of Buddhism. 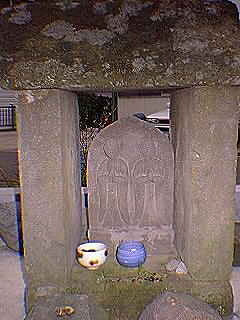 Guardian deity of roads and village boundaries, worshiped in the form of stone images along the roadside. Also known as sae no kami, an ancient designation that suggests the function of 'obstructing' or 'keeping out' sae(evil spirits). The dosojin is often identified with the god Sarudahiko, who guided Ninigino-mikoto, the supposed ancestor of the imperial line, on his descent to earth. The object of workship takes various physical forms. Today, dosojin function also as gods of marriage(You can see a couple of gods), birth, and other rituals. They are widely feted throughout Japan during the burning of the New Year's ornaments dondo-yaki on 14 and 15 January. Children in some regions go door-to-door to solicit rice cakes or other offerings 'for the dosojin', and they eat it. In this region, dondo-yaki is on 14 January, at Tenmangu shrine next to Teishoin. God who protects rice plants and brings about abundant rice crops. Farming folk venerate the jishin deity that is identicial with the ta-no-kami(god of the paddies): the yama-no-kami(god of the mountain) descends from the mountains in early spring to become the ta-no-kami and after the harvest returns to his abode in the mountains. One of the most popular bodhisattvas in Japanese Buddhism. Jizo is usually represented as a monk with a jewel in one hand and a staff in the other. Jizo's vow to aid and benefit all suffering begins has made him an object of popular veneration since the Heian period. 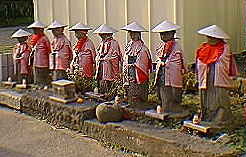 Jizo is often syncretized with native deities. He is particularly regarded as the savior of children and souls in hell. I refered to the 'Keys to the Japanese Heart and Soul' by Kodansha.